Papers: ca. 1856-1965, 10.33 cubic feet. The collection spans Henry Wattersons years as editor of the Courier-Journal from 1868-1919. The bulk of the collection covers the years from 1910-1919, and includes personal and business correspondence, galley proofs of his editorials, financial records, and newspaper clippings. Correspondence includes letters detailing presidential politics, especially the 1912 campaign; the Watterson family; Courier-Journal business; Ky. politics; and World War I. Several letters and telegrams between George Harvey and Watterson reveal their feelings toward Woodrow Wilsons nomination for the presidency. Printed editorials and galley-proof editorials reveal Wattersons views on many different issues between 1900 and 1920, including presidential and gubernatorial elections, prohibition, local politics, Theodore Roosevelt, William Jennings Bryan, the Night Riders, and historical topics. Also includes newspaper clippings that feature his role in national party politics and many of his public appearances. Papers: Papers: 1863-1946, 1.33 cubic ft. The papers of Henry Watterson include correspondence, editorial galleys, and newspaper clippings spanning Wattersons career as a Confederate soldier, editor of various newspapers, and as editor of the Louisville Courier-Journal. Correspondence includes letters between Watterson and his fiancee, Rebecca Ewing, throughout the Civil War and while he was assuming the editorship of the Louisville Journal in 1868; letters from his father, Harvey Magee Watterson; and from other prominent political figures. Editorial galleys include drafts of a few of his speeches, and editorials concerning political disputes of the era and presidential elections. Newspaper clippings include stories, articles, and editorials relating to national politics and Wattersons role in them. A collection of papers of Henry Watterson consisting of mostly incomplete correspondence, 1885-1915; chapters of a novel, practically all incomplete, numbered I-XXXIX, with gaps and duplications of numbers; and drafts of speeches, editorials, articles, a play, and another novel, nearly all of which are incomplete. Papers: In the Young Ewing Allison Papers, 1840-1933, 16 cubic feet. Other authors include Henry Watterson. Papers: In the Alexander Konta Papers, 1915-1922, 2 volumes. Papers: In the Hamilton Club of Chicago Records, 1911-1912, 27 items. Persons represented include Henry Watterson. Papers: In the John Milton Hay Correspondence, 1854-1914, Valin to Watterson, approximately 6,000 items. Microfilm: ca. 1857-1983, 7 reels. Copies of papers of Henry Watterson at the University of Louisville. Papers: 1863-1920, 8.4 linear feet. Papers relating to the Louisville Courier-Journal, of which Henry Watterson was editor. Correspondence received from political leaders and fellow journalists pertains to the Marlowe theory of the authorship of Shakespeares plays, Abraham Lincoln, national politics, prohibition, woman suffrage, and Woodrow Wilson. Correspondents include William Jennings Bryan, John Hay, Elihu Root, and Booker T. Washington. Papers: ca. 1870, 1 page. A letter from Henry Watterson to Bayard Taylor written around 1870. The letter is written on Everett House letterhead. Watterson writes a friendly note, confirming arrangements for the two to meet the following morning. The papers of Henry Watterson are preserved on microfilm and include letters, telegrams, editorials, speeches, newspaper clippings, family history, photographs and Wattersons autobiography. This collection records the newspaper editors career and documents, through his editorials and correspondence, his stand against protective tariff, his objection to the Civil Service Act, endorsement of the Gold Democrats in 1896, his opinions on William Jennings Bryan, the rift and subsequent reconciliation with Woodrow Wilson, his views on American involvement in World War I, his opposition to womans suffrage and other political/ social/ economic issues. Among Wattersons correspondents were William Jennings Bryan, Clarence Buel, David Starr Jordan and Wayne MacVeagh. 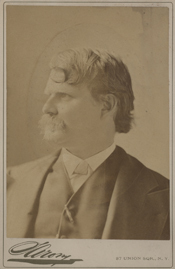 Topics of his editorials and correspondence included politics, journalism and reconstruction. Several of his editorials were written on William Jennings Bryan, Theodore Roosevelt, William Howard Taft and Woodrow Wilson. Also present is Wattersons autobiography which ran as a serial in the Courier Journal in 1919. Wattersons favorite topics for speeches were Abraham Lincoln and journalism and are included in his speeches. There also are newspaper clippings from around the country and Series a collection of genealogical materials of Henry and Rebecca Watterson and includes various memorabilia. These materials consist of autograph letters and editorials by Henry Watterson, along with various newspaper articles. The letters are from Watterson to Henry Wilder Allen, Gen. Brice, Augustus Thomas and the English publisher, Alexander Macmillan. Watterson sent also Macmillan a copy of the Republican Banner. Several editorials by Watterson which appeared in the Courier-Journal are included one of which is a manuscript copy of a comment about the Democratic National Convention in 1912. Newspaper articles on Kentucky history are also contained in the papers, as are obituaries and a memorial pamphlet written on the death of Watterson. Papers: ca. 1870-1920, 8 items. The Henry Watterson collection contains two verses of an unidentified poem; an essay Harmony; an autobiographical sketch and an autograph. In correspondence he describes and ridicules Confederate general Braxton Bragg; corrects a quotation; comments on travels; praises the Literary Digest; and asks if a correspondent is related to Col. William A. Seaver. Correspondents include Don Carlos Seitz, J.W. Charles and William Woods.